The Kurdish national flag, hoisted in Erbil, Iraq, 18 October 2016. Picture by Jens Kalaene/DPA/PA Images. All rights reserved. The Kurds in Iraq will probably back the principle of independence from Iraq in three months time. Kurdistan President Masoud Barzani grabs a book about Kurdish independence written in 1905 to demonstrate the pedigree of their struggle. He also tells me how Winston Churchill and the Iraqi King chewed the cud about Arab-Kurd equality rather than an Arab Iraqi empire. 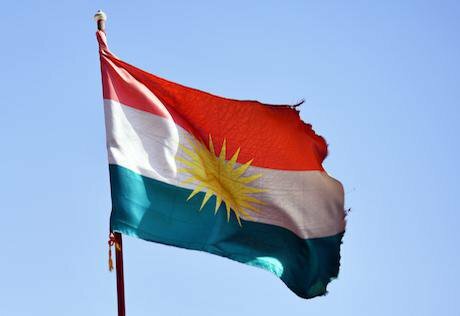 But Baghdad constantly spurned Kurdish equality and the record of discrimination and genocide weighs heavily as the Kurds approach an independence referendum on 25 September. As a seasoned diplomat, Zebari emphasises strategic interests. For Turkey, he says, 'Kurdistan is the only place from which they can ensure energy supplies,' and is 'a buffer between them and the expansionism of Shia militants.' Furthermore, Erdogan's recent victory in a controversial constitutional referendum relied on the votes of millions of Kurds in Turkey. Kurdistan's second biggest trade partner after Turkey is Iran, which Zebari says is 'opposed vehemently and has the tools to derail and sabotage' independence but is itself under 'intense economic and military pressure' from the US and the Gulf States. Zebari insists that 'we don't want a complete break up with Baghdad [because] Baghdad will still need us and we will still need Baghdad' in continuing commercial, cultural and security links. He highlights the Iraqi Prime Minister's comment that the Kurds have a natural right to independence. The major sticking point to an amicable divorce is the formal incorporation into Kurdistan of disputed territories such as Kirkuk, an emotive issue for Kurds and Arabs alike, and whose oil and strategic position are vital. Zebari acknowledges American fears but says Kurdistan is 'the only trusted ally of the Americans,' whose 'almost bases' in Kurdistan supply the military effort in Syria more than NATO's air base in Incirlik in Turkey. He adds that 'the Shia are not America's friends, Iran is domineering every aspect of Iraq's political, security and military life' and that Kurds worry about Shia militias which are 'expanding and encroaching' on Kurdistan. The Kurds are under pressure on the timing of the referendum and Zebari says Britain asked that the Iraqi Parliament approve the referendum, as Scotland's was by the Commons. He retorts that Iraq lacks a Westminster. But so does Kurdistan. Its parliament was suspended in 2015 when security forces controversially prevented the Speaker from returning to Erbil after violence in the second city of Slemani amid deep disputes about the status of the Presidency. Differences were amplified by war and the influx of nearly two million refugees which increased the population by a third. Collapsing oil prices sank its once booming yet dysfunctional economy into a crisis of unpaid wages, increasing debt and deficit, increased unemployment and poverty, and stalled investment. The Prime Minister and Deputy Prime Minister, Nechirvan Barzani and Qubad Talabani, have pioneered biometric mapping of the state workforce to eliminate illegitimate jobs and have introduced austerity measures to close the deficit between lower revenues and state spending. But more is needed and that requires a Kurdistani consensus to ease the political pain. The international community will urge more reform once Daesh is defeated. The menu is well-known and Kurdistan's friends should offer tough love conditional on thorough reform. It needs less state employment and less reliance on energy exports. It needs to diversify its economy to earn more income from agriculture and tourism in a beautiful landscape that already attracts Arabs in their millions. All this requires a much bigger private sector to boost dynamism and a bigger tax base to underpin political pluralism. Over the years, I have heard much rhetoric about reform and in some areas seen negligible change. It is difficult to persuade people, for instance, to leave the cities and work in the countryside where life is slower and services are worse. At the same time, the government has pulled off major changes such as a detente with Turkey, which was once poised to invade, and the development from scratch of an energy sector whose exports reach the world through Turkey. Its security is also commendable. My last visit was bookended by the Manchester and London Bridge atrocities which made me very aware that I was safer in Kurdistan than in London. A powerful argument for statehood is that it deprives opponents of excuses for not reforming and also enables greater access to development and capacity building funds that are denied sub-sovereign entities. But it's not all about governments. People also have to work harder and smarter in what I call a patriotic work ethic. I mention to Zebari that I once asked a senior leader if the average working day in the bloated state sector was 25 or 45 minutes - the leader had plumped for the former. Zebari chuckles and says 'our biggest problem is that we are not accustomed to the culture of work, things go slowly and people don't know how to operationalise ideas but independence is a huge project, your future. I tell many of my friends and colleagues - how can you build a state when you close your door at 2pm.' It's nearly 2pm and our time is up as Zebari heads to Europe for a conference as part of increasing efforts to persuade the world that they are deadly serious about commencing the countdown to Kurdexit in September. The formal opposition of great powers will not, I think, stop the referendum. It is probable that the Kurds will vote yes but not reach the 98.8% yes vote achieved in 2005 in an informal civil society referendum in which nearly two million people participated. Zebari hopes for more than 50% plus one and others are talking about 80% but the referendum is just the start of a move to convince Baghdad that an amicable divorce is better for all. When I began working with the Kurds a decade ago they focused world attention on what they called 'the other Iraq' but that is now maybe becoming the new Kurdistan.